Read 2 times. Last read March 31, 2018 to April 6, 2018. Really quite excellent, this book covers a tremendous amount of ground in a relatively small number of pages. 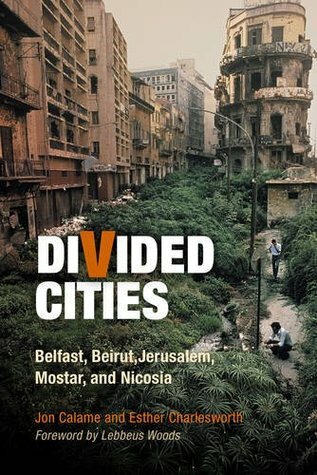 Exploring five cities divided by conflict - Belfast, in the wake of the Troubles; Beirut during the Lebanese Civil War; Jerusalem between 1947 and and the Six-Day War (and again after 2003, in an epilogue); Mostar in Bosnia, caught between Serbs and Croats; and Nicosia, Cyprus. The divisions and partitions take many different forms: the "Green Lines" that split Jerusalem and Beirut in two and which continue to separate Turkish and Greek halves of Cyprus, the no-man's-land of the Boulevard of National Revolution in Mostar, and the "interface barriers" erected as needed to separate quarrelsome and violent factions in Belfast. Each city is given a section covering both the history of the conflicts leading to its partition (and subsequent reunion, in some cases), including some much-needed and illustrative maps. I'll confess my own ignorance of much of the details around these specific conflicts, and for that alone the book was worth it. But you also begin to get a sense of these cities caught in the middle of something larger, the innocent civilian populations who are made to suffer for another's cause, the neighbors and friends who turn on each other in the midst of civil wars and sectarian uprisings. This tension is explored in depth. Planners fear their work becoming "politicized," but as can be seen even in the peacetime west, that's almost an inevitability regardless of specifics or location. As one planner in Mostar said, "planning is always a compromise between a profession and the politics - 50 percent approximately...however, today's politics outweigh the profession. Its share in deciding today is 95 percent and above." The key for the planner in a divided city is to get one's hands dirty; to not refrain from participating in the design of the built environment, however far from ideal it might be. Other findings seem to apply almost as equally to the subject cities as to today's increasingly stratified, bifurcated urban polities: "Observable results [of urban partitions] include increased mutual avoidance, apathy, a growing conviction that a rival group uis responsible for assorted social ills, and a lack of interest concerning the activities of residents on the other side of the partition [emphasis mine]." Many of the cities featured in this survey were divided as a result of British imperial withdrawal. Britain's colonial preference of favoring a chosen ethnicity or other particular group - at the expense of the others - is well-documented in Jerusalem and, of course, Belfast, and London's dithering over the Cypriot crisis coupled with an inability to broker a compromise led to the island's inhabitants taking measures into their own hands. Britain's persistence in devising constitutions and legislatures predicated on ethnic quotas and representations led to an emphasis on in-group/out-group identity that did not exist in the same way prior to their rule. The legacies of empire continue to last and to linger over these divided lands. But there is also grounds for hope. Nicosia's sewage system is impossible to duplicate for a separate northern and southern system, and so a single unified treatment plant and sewers are run jointly by Turkish and Greek engineers. Finding room to cooperate where possible - particularly on a local level, where politicians and leaders are less beholden to national sentiments and resentments - is key to overcoming hatreds and unnecessary redundancy. But this doesn't come naturally to a divided city. Sign into Goodreads to see if any of your friends have read Divided Cities. 51.07% "Man, this is great and a breeze to read, too"